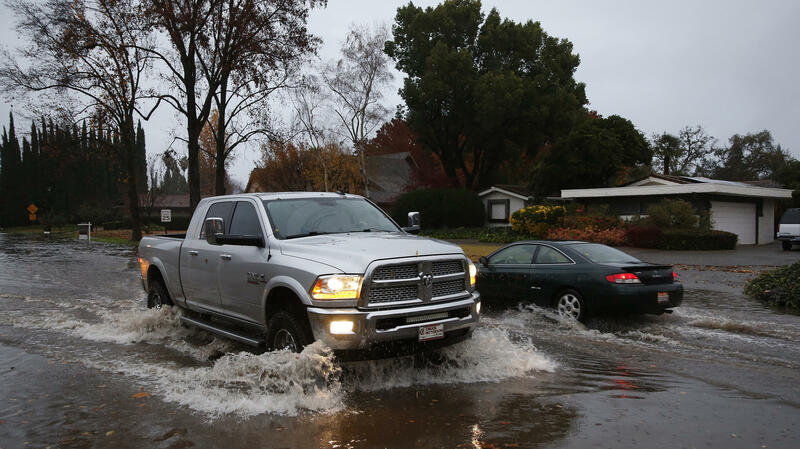 Vehicles pass each other on a flooded street in Chico, Calif. Flash flooding hit a wildfire-scarred area of Northern California on Thursday, forcing officials to deploy swift water rescue teams to save people stuck in vehicles and rescue them from homes after a downpour near the Paradise area. "We have responded to reports of a number of stranded vehicles in the roadways," Carhart said. "It rained really hard in a short amount of time and this whole thing came up really quickly," Carhart said, explaining that "the roots and the bottoms of the utility poles are just kind of swimming," according to The AP. Officials said there's also the possibility of mudslides, especially in areas charred by the fire. The National Weather Service said a flash flood watch for the Camp Fire burn area will be in effect until 10 p.m. PST. Officials said the heavy rainfall "could quickly become a dangerous situation." "DO NOT DRIVE AROUND BARRICADES. TURN AROUND...DON`T DROWN!" the statement warned the public.